Columbia Street Greenway: Spring Kick-off on April 10th! Calling all mulch-lovers and wanabees…this is the event you have been waiting for! 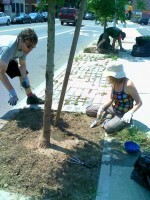 On Saturday, April 10th, Brooklyn Greenway Initiative and our friends at the Columbia Waterfront Neighborhood Association (CoWNA) will be mulching tree pits along the Greenway from Atlantic Avenue to DeGraw Street. We’ve been watching these new trees burst into life during the early spring, and we want to help give them the best chance to survive and thrive in the years to come. Mulching tree pits keeps water from evaporating, reduces soil compaction and improves the soil as it breaks down. We will also be planting morning glory seeds along the fence on the west side of Columbia Street to put more “green” along the Greenway. Thanks to the New York City Department of Parks and Recreation for providing mulch and tools, and thanks to Home Depot Foundation and Waste Management for underwriting BGI’s 2010 greenway stewardship programs. This Saturday, we’ll also introduce our monthly Kids Bike Too(day)! Bring your kids, on their bikes, and learn together how to take care of trees. Kids will have fun pedaling along the Columbia Street greenway, but please keep a close eye on your charges. While this off-street section of the greenway will soon connect to the Pier 6 section of Brooklyn Bridge Park, Columbia Street is also a busy street. Tools and gloves provided; pizza will be served at 1:00PM. All ages welcome, and feel free to invite groups of friends, families and co-workers too.